Have I mentioned that I am currently obsessed with textures? No? Well, I am. Not only did I hunt down the L’Oreal Gold Dust collection but I tracked down the (new?) 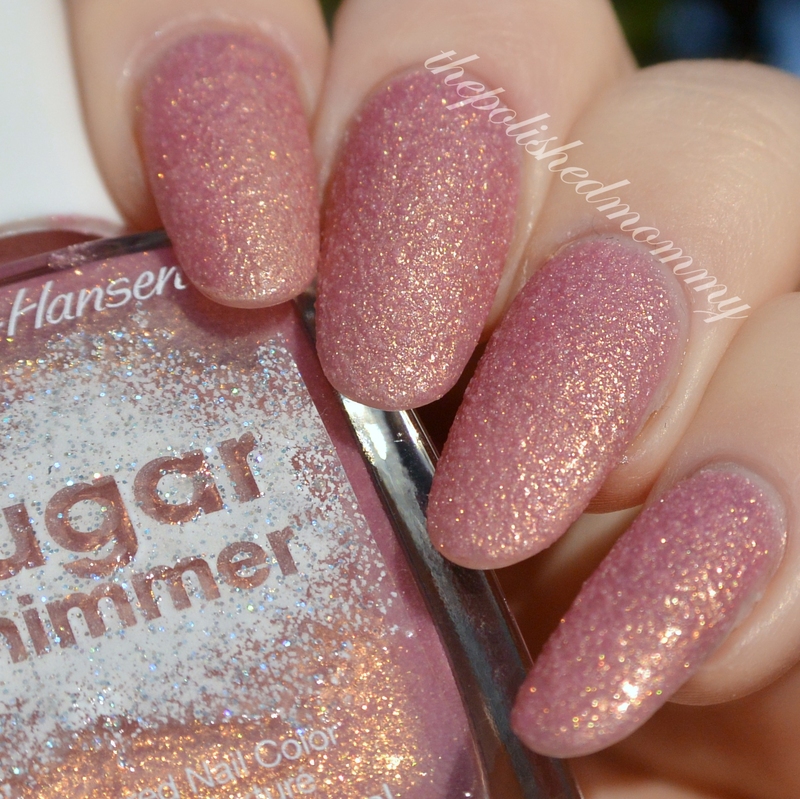 Sally Hansen Sugar Shimmer collection. I didn’t get all the colors (only passing on 1 or 2) but the ones I did get look SOOO pretty! I was most excited to get Sugar Plum, based on the swatches it looked gorgeous and I couldn’t wait to see it in person. Sugar Plum is a pale peach pink with strong golden shimmer textured polish. The texture is similar to that of the Sugar Coat collection, very gritty (like sand), unlike the textures from the Gold Dust collection which are glitter based. It was a little on the sheer side, 2 coats gives you full coverage but leaves a mild VNL so I used 3 coats to make it fully opaque. I also added a thin layer of top coat. I have to say I am not at all disappointed with this color, the shimmer looks amazing and the peachy pink color compliments my skintone nicely. If you didn’t want to do 3 coats of this a similar colored base would work great. I also really love the packaging, I’m a sucker for pretty packing and I love the way the name looks like it was dusted with powdered sugar (and then sprinkled with glitter!). I believe these were $3.99 at Ulta and I was able to use the $3.50 off $10 coupon I got in the mail, making them pretty cheap!